How do I obtain my medical records following childbirth? 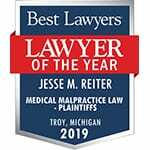 December 12, 2018 /in Birth Injury Lawsuits /by Reiter & Walsh, P.C. I had prenatal care at a federally-funded clinic/community health clinic and my child had a birth injury. Can I pursue a case? August 8, 2016 /in Birth Injury Lawsuits /by Reiter & Walsh, P.C. Just because a clinic or health center is federally funded doesn’t necessarily mean you can’t pursue a case. Free clinics and tribal clinics, for example, are covered under the Federal Tort Claims Act (FTCA), which means that those treated there have recourse to justice, even though the path to pursuing a case may differ slightly…. My baby had a birth injury at a military hospital. Can I pursue a case?